Bates’ connections with Maine’s Native Americans grew a bit stronger this spring as students visited Indian communities. In April, Bates students gave presentations about college life to schoolchildren of the Wabanaki tribes — the Maliseets, Micmacs, Passamaquoddies, and Penobscots. The tour was a program of the Wabanaki-Bates-Bowdoin-Colby Collaborative, designed to encourage Wabanakis to take advantage of higher education in Maine. In May, history professor Joseph Hall Jr. brought his “Wabanaki History in Maine” Short Term class to Penobscot and Passamaquoddy communities. This time the Bates students were on the receiving end, learning from tribal representatives about myriad facets of Native American life and history. 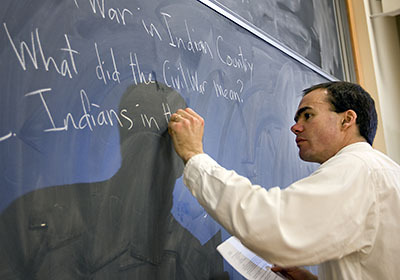 Hall first brought a Wabanaki-history class to meet Maine Indians in 2007. What was new this year was the participation of Wabanakis as classroom teachers: James Francis, Penobscot tribal historian, and Rebecca Sockbeson, a Penobscot completing her doctorate at the University of Alberta. “They made clear that Maine Indians don’t need ‘help,’ but do need respect and understanding,” Hall says. “They both taught with me because, as Rebecca said, ‘Education is the best remedy against racism,'” and bias against Indians persists in Maine and elsewhere. But the conversations weren’t all about the trials of Wabanakis. “Students seemed surprised to find how they are creating new ways to live in Maine, whether it’s reviving languages that few speak, crafting baskets, or pursuing economic development,” Hall says.